MPBNGC is a multiobjective proximal bundle method for nonconvex, nonsmooth (nondifferentiable) and generally constrained minimization. The software is free for academic teaching and research purposes but I ask you to refer at least one of the references given below if you use it. If you have any questions conserning the software, please contact directly the author Prof. Marko M. Mäkelä. - testprogram for proximal bundle method. - (multiobjective) proximal bundle method. - subroutines for solving quadratic subproblem. - subroutines for proximal bundle method. M. M. Mäkelä, "Multiobjective Proximal Bundle Method for Nonconvex Nonsmooth Optimization: Fortran Subroutine MPBNGC 2.0", Reports of the Department of Mathematical Information Technology, Series B, Scientific computing, No. B 13/2003, University of Jyväskylä, Jyväskylä, 2003. 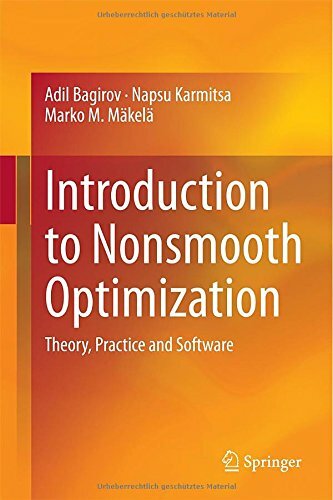 M. M. Mäkelä, P. Neittaanmäki "Nonsmooth Optimization: Analysis and Algorithms with Applications to Optimal Control", World Scientific Publishing Co., Singapore, 1992.